So the holidays came and went, and odds are you ate a lot more than you normally would. While you probably ‘felt’ like you gained tons of weight, studies show that a person of ‘average size’ only gains about one pound between Thanksgiving and the New Year. If you’re overweight, that number jumps to about five pounds. While a pound here and there doesn’t seem like much; they can add up quick! Like most Americans, you probably started off January with the most common of New Year’s Resolutions – losing weight and getting fit. You woke up on Jan. 1 focused and immediately started searching for ways to shed those extra holiday pounds. Most likely, you Googled ‘weight loss’ or opened a few health magazines only to come across the term ‘Body Mass Index’ or BMI for short. Simply put, BMI is a way of measuring your body fat based on how much you weigh when compared to how tall you are. Though we all have different body types, there is an ideal weight for your height. Finding out your BMI tells you whether you’re considered underweight, normal weight, overweight or obese. 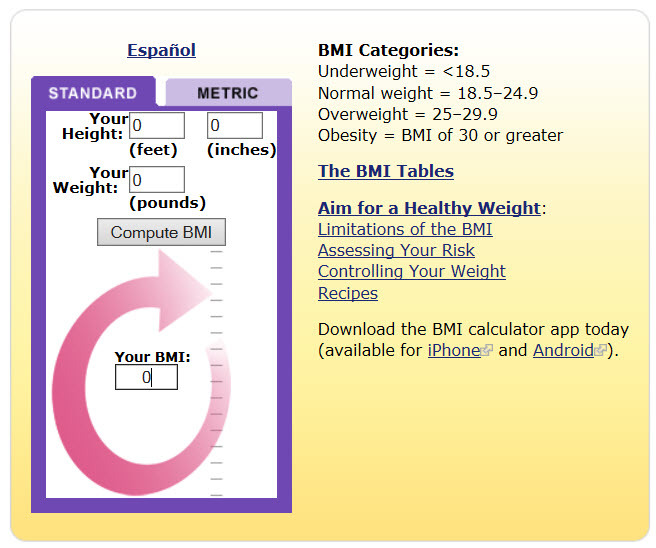 Click to see this simple formula that figures your BMI. Remember, your BMI number is only a first-level indicator that can be slanted in many ways. For example, muscle has more mass than fat, so many athletes are heavier and often go over the recommended BMI for their height. Like anything in life, a BMI score should be balanced, with extreme numbers at either end of the scale being harmful. Most experts say it’s best to keep between the 18.5 to 24.9 range that many consider healthy. Are you still keeping up with this year’s resolution? We’re only a month into 2017 and there’s a really good chance many of you have already fallen short of your initial goals. Don’t give up! It’s still early in the year and your weight/BMI scores aren’t forever. Now is the time to refresh your goal – eat right – exercise – and schedule an appointment with your doctor if you have any concerns about your health. Dr. Rirchard Petrucci joined WellCare in January of 2013 as the New York State Market Medical Director where he successfully improved the market’s Medicare and Medicaid Quality scores. In February of 2015 he was promoted to Corporate Chief Medical Director for Quality. He is responsible for the Corporate Quality Data Analytics Team, Quality Clinical Improvements Team and the Quality Accreditation Team. Previous Previous post: WellCare of Nebraska Goes Live!